Grant will go to construct an "Automotive Center of Excellence"
Georgetown, DE – Delaware Technical Community College has received a $1.97 million grant from the U.S. Department of Commerce’s Economic Development Administration (EDA), which will support the construction of a 13,500 square foot Automotive Center of Excellence (ACOE) on the College’s campus in Georgetown. 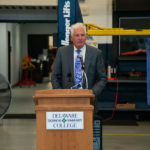 This facility, along with the College’s new training center in Middletown, will house the first diesel mechanic training program in the region. 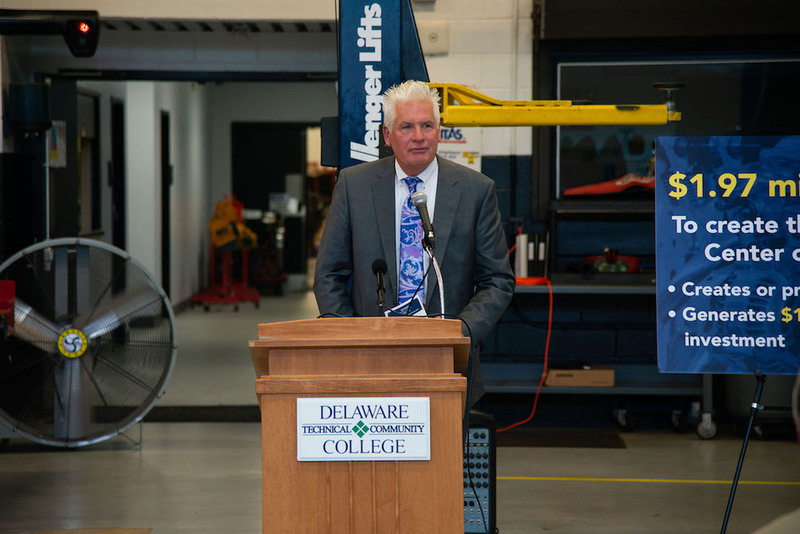 The ACOE will double the number of automotive technicians trained at Delaware Tech in Georgetown each year from 20 to 40 and will allow the College to train up to 15 diesel mechanics per year. Multiple industries in the region rely on automotive technicians and diesel mechanics including agriculture, fisheries, car dealerships and other automotive service providers, and construction. A Burning Glass search in April 2018 revealed that over the last 12 months there were 180 job postings for automotive technicians and 126 job postings for diesel mechanics in the Delmarva region. Employers report high turnover due to intense competition for skilled workers, difficulty retaining workers recruited from out of state, and high costs associated with sending unskilled workers to other states for training. Labor market data indicate more than 3,000 automotive technicians and more than 800 diesel mechanics are employed across Delmarva with average annual earnings of $39,874 and $44,595, respectively. Over the next ten years, the region is projected to have 3,278 openings for automotive technicians due to retirements, job turnover and a 7% growth rate. Nine hundred forty-eight (948) job openings are expected for diesel mechanics in the same period due to retirements, job turnover and a 17% growth rate. PHOTO CAPT”ION 2: Terry Megee, owner of Floyd A. Megee Motor Company in Georgetown, addresses the crowd at the EDA Grant Announcement. Terry and Vanessa Megee were leaders in the effort to raise matching funds needed for the grant. 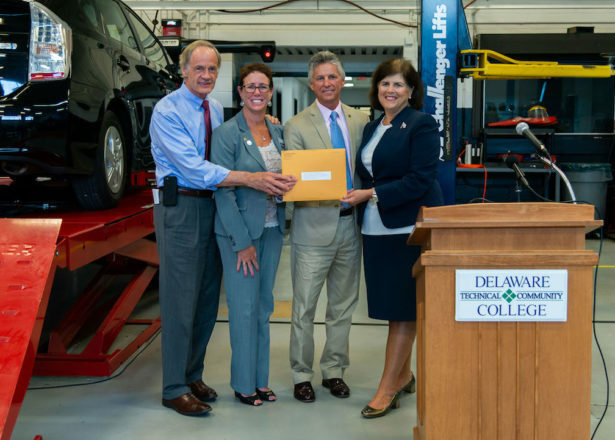 Delaware Tech -- the First State’s only community college -- offers academic, technical, continuing education, corporate and community training comprising more than 100 associate degree, diploma and certificate programs. The College is accredited by the Middle States Commission on Higher Education. Delaware Tech has four campuses across Delaware in Georgetown, Dover, Stanton and Wilmington. Visit www.dtcc.edu to learn more about all programs.